A hands free magnifier can allow you to read, sew or do your favorite hobby without having to hold a magnifier. As your macular degeneration progresses you will need different magnifiers for different tasks. A handheld magnifier is good for briefly looking at a photo, reading a label or a price tag, but it can quickly be problematic if you are trying to use your hands and use the magnifier at the same time. There are several magnifiers for macular degeneration that are hands free. Sometimes you will just need to try different styles to find out what you like best. Inquire about the return policy before you buy so that you can return the magnifier if it doesn't meet your needs. where you will be using the magnifier. Do you get tired of holding your magnifier and having to constantly adjust it to get it focused? Try one of these neck magnifiers for when your want to sit in your favorite chair and enjoy your favorite author. This necklace magnifier offers a viewing area of 5". This one magnifies 2.5X with a spot 5x magnifier. The lens is scratch resistant and is mounted in a sturdy, but lightweight frame, so it is comfortable to wear for extended amounts of time. The string or lanyard is adjustable so that each individual can benefit from it being at just the right distance from the reading material. The goods news is that this page magnifier also offers light using three AAA batteries. Of course this lighted hands free magnifier can be useful for other hobbies besides reading. Use it for crafts or other detailed work so that your hands are free to hold tools, printed material, or sewing needles. A headband magnifier is worn like glasses and your hands are free to work on your hobbies that require detailed vision or for just looking through the mail. Keeping your hands free, a head magnifier can be used for hobbies or doing repair work in the garage or basement. Use this magnifier for doing fine detailed work like needlework, electronics, detailed gluing, soldering, etc. If close accurate work is something you do or enjoy, then a head magnifier is a great addition to your visual aids for macular degeneration. "My 92 year old dad could not live without his optivisor, he needs it to see everything, pay his bills, read his mail etc. As a severe macular degeneration sufferer, the Donegan-10 Optivisor is truly a godsend for him." The lenses are interchangeable so you can buy more than one. Remember that the stronger the magnification, the closer you need to be to the object you are viewing. Many people like the wide viewing area and use it for reading. Magnifying lamps provide three features that are most needed by those with macular degeneration - light , magnification and hands free. A magnifier floor lamp can be set next to your favorite reading chair so all you have to do is hold the book. The lamp needs to adjustable - either with a swing arm or a gooseneck. The light and the magnifier need to be positioned so that the magnifier is in focus and for the light to shine on the reading material or hobby. LED lights offer several benefits - they are cool and won't get hot like other types of bulbs and they won't burn out (well, maybe after 100,000 hours of use they will). While the magnification is only 2X the bright LED lights make this lower power magnifier useful to many people with macular degeneration. "I purchased this product for my Grandfather, who is 81 and suffers from moderate-advanced macular degeneration. He is unable to drive, and within the past year or so has not been able to read or do any of his beloved crossword puzzles. After much grumbling on the subject, he tried this lamp and he is now able to complete two puzzles a day! It is sturdy enough that it stands on the floor without tipping over, an issue we had with other lamps. It is adjustable but works best when seated in a normal chair. The face of the magnifying glass is large enough to show a large area without having to move your reading material. It also has four sets of LED lights around the rim so the entire subject is equally and brightly illuminated. 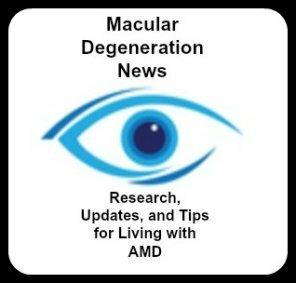 I would recommend this to anyone with macular degeneration or vision loss." A desk magnifying lamp can be used at your desk, workbench or craft table for hobbies like sewing, jewelry making or small engine repair. A gooseneck desk lamp is useful for office work, hobbies or crafts that need a flat surface to work on - whether it is a work bench in the basement or a craft table in a spare bedroom. This magnifying desk lamp is about 3.5" in diameter allowing one to see a larger area than what most hand held magnifiers can accommodate. The 2X power magnifier combined with 18 bright LED lights reduce eye strain and make it possible to see small pieces or lettering. An even more powerful 6x magnifier is available as an inset into the lens. The gooseneck makes it easy to bend the magnifier and light to just the right position for clarity and brightness. The weighted base prevents it from tipping over. Cool LED lights mean it can be left on for hours without getting hot and they never burn out. You can use a clip-on magnifier at your workbench, craft table, desk or counter. Simply clamp the hands free magnifier onto the table or surface where you need additional magnification. The three features you want to look for in this type of magnifier is a high quality clear lens, added lights, and a gooseneck or adjustable arm. Light allows a person to see better with less magnification and an adjustable arm allows the light and magnifier to be placed at just the right spot. It can be moved and placed where needed - a desk, a counter, a table, or a work bench. The clamp on this one will accommodate up to 2.5" thickness. Don't give up hobbies or crafts that you enjoy because you can't see the details anymore with your regular glasses. This clamp on magnifier magnifies 2.5X. With better light comes better vision. Take this clamping magnifier anyplace that doesn't have light - because the light is built right into the magnifier. The gooseneck on this magnifier is durable yet flexible so that it can be maneuvered into any position - AND it stays there. You can clamp on this magnifier where ever you are doing your project - on a workbench in the garage or your sewing table in the bedroom. It can be used anywhere even if there is no access to electricity thanks to it's dual power feature using 3 AAA batteries. This Carson clamp on magnifier has 2x magnification but with a spot lens of 3.5x. It uses 3 bright LED lights for better visibility and a strong adjustable arm. It's important that once the light and magnifier are adjusted to where your project is in good focus, that the adjustable arm stays there. This one does that. Use this type of magnifier for hobbies like needlework, fly tying, jewelry making, wiring, or other hobbies that require detailed vision. The 2x magnification wit the light may not be enough magnification for those with advanced macular degeneration - so check out the return policy before purchasing. Carson offers a magnifying visor with 4 interchangeable lenses. The magnification power of the three lenses are 1.5x, 2x 2.5x and 3x. In addition to magnification this one includes an adjustable LED light which runs on three AAA batteries. A hands free magnifier is incredibly versatile -- great for any sort of close work. Use it to remove a splinter, trim toenails, make jewelry, check your cat's ears, do some delicate bead work, or read that fine print on the medicine bottle. There are many applications in which this useful magnifier can enhanced your vision. Keep it handy and you will find that you will use it several times a day.